Arrival at the Marrakech airport, transfer to the city, overnight in a riad. After breakfast, we will meet the cook/muleteer and then start the trek to the Imnane valley via Tizi n’Tamaterte pass (2279m); stunning views over both the Imlil valley and the surrounding summits, walk to Ouanskra and then down along the valley to cross several Berber villages including Tamguiste, Tinghrine, Ikkis, Amsakrou and Arg. Arrival at Imsker in the afternoon. Overnight in a local guesthouse. 6 – 7 hour walk. After breakfast walk up an easy uphill to cross Tizi n’Elbour (1900m), down to Imi Oughlad (1350m) and then walk up towards Tizi n’Tacht pass (2000m) via a juniper forest. 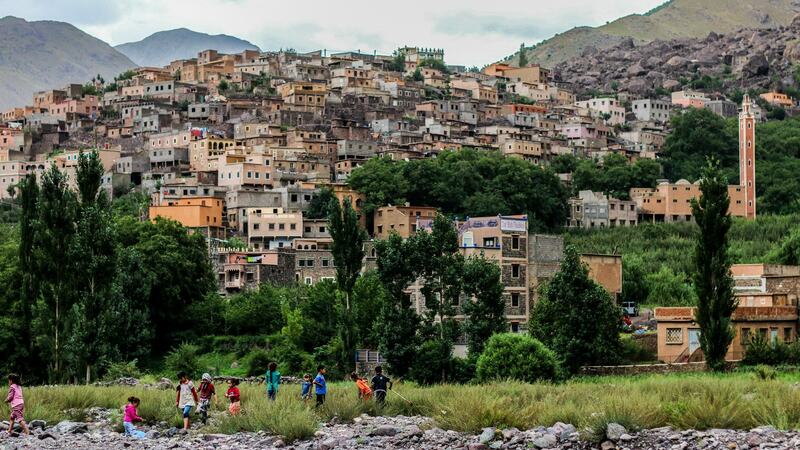 You will enjoy panoramic views over Mount Oukaimeden & the Berber villages (Tinintine, Tagadirt n’Ait Ali). Lunch on the pass and then you will continue to the authentic Azzaden valley, arrival at Id Issa village. Overnight in a local guesthouse. 6 – 7 hour walk. After breakfast walk up towards M’zzik pass (2450m). The pass offers wonderful views over the Imlil valley with its Berber villages. It will be also the place where you will stop for lunch. After lunch there will be a downhill walk to Aberdoune spring. Then we will continue to the village of Armed, which will be the end of the journey and also the place where you will spend the night prior to the. 6 hour walk. Early start (around 9 AM) to walk up the Ait Mizane valley passing by the holy shrine (2400m). Here you will stop for lunch, which will be prepared by our cook, and then carry on walking to reach the Toubkal Refuge (3207m) where you will likely be sharing a bunk room with other trekkers tackling Toubkal early the next morning. Overnight in the refuge (3207m). 6 hour walk. After breakfast (5 AM), trek up to Toubkal summit. Start with a steep single path on the east side above the base camp, very slow and progressive walk until Tizi n'Toubkal (4000m) where you could see clearly the summit. Another 30 minute walk on the ridge to reach Mount Toubkal summit, which will provide marvelous moments observing the silent beauty of the rocks lit up with the sun’s first rays. Afterwards trek back down to the hut for lunch, and then an afternoon walk to return back to Armed village for one more night before returning to Marrakech the next day in the morning. Overnight in a guesthouse in Armed. 8 - 9 hour walk. After breakfast a downhill walk to the Imlil town where you will meet your driver. From there you will be taken back to the riad in Marrakech. Transfer from the riad back to the airport.